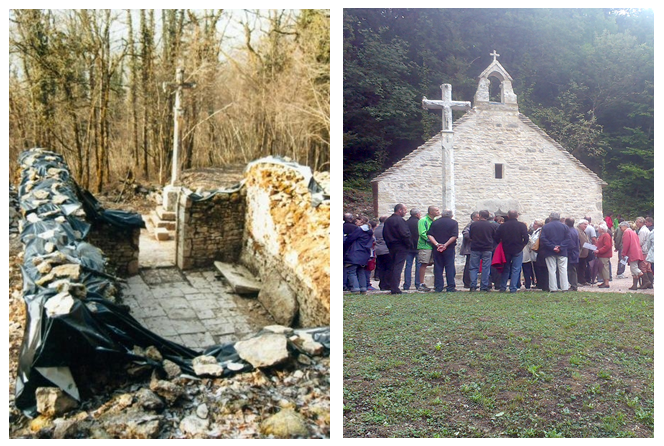 When we first arrived in Villy en Auxois, our new friends soon showed us a ruined chapel in the woods above the village. No-one seemed to know much about it, although some said it was dated to the 15th century and possibly associated with a leper colony. There really wasn’t much to see. The roof was gone, the walls mostly collapsed, in a few more decades it would disappear totally. However, after a couple of years, a small group of people started to talk about the possibility of restoring it. To be honest, I wasn’t that hopeful. The chapel didn’t have any great architectural interest – it was after all, just a modest 15th century funerary chapel for a local leper community (at least that was the understanding). However, research was done and it transpired that the chapel was a lot older than previously thought. In fact the unearthed lintel showed an inscription which stated that Jean de Vienne, Amiral de France, Seigneur de Franche-Comté, had restored the chapel in 1346 – so its origins were pushed backwards dramatically. Indeed it seems most likely that it was originally constructed between 500 and 800 ! So instead of a chapel that had stood for 500 years, we had one that had stood for 1,500! This discovery prompted feasibility studies and grant applications, and finally the colossal amount necessary to restore the chapel 300,000 € was granted. Work went on and was finally completed in 2013. 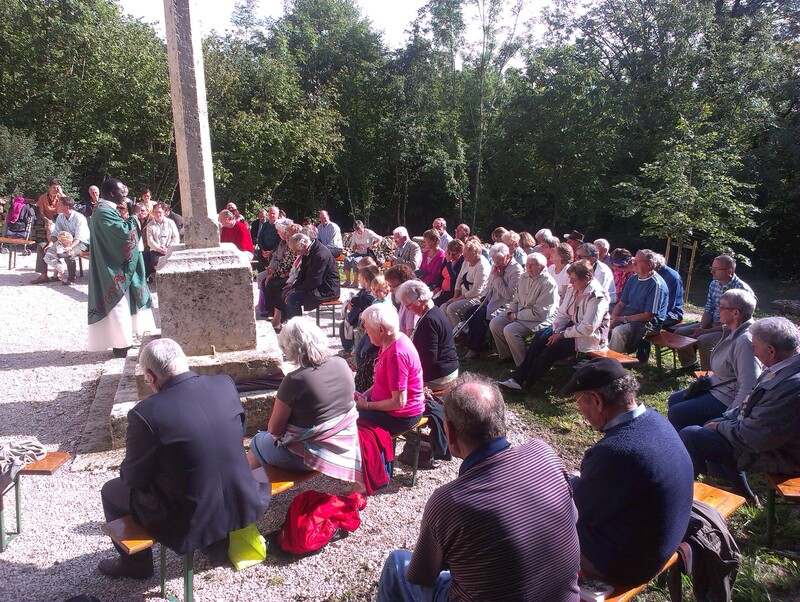 An inaugural re-dedication mass was finally held on Saturday 16th August 2014. My wife and I were present at that mass. Indeed, my wife had been asked to organize the mass and lead the singing. I ended up operating the sound system. Two Protestant Evangelicals present and intimately involved, in a Catholic community’s re-dedication mass of a chapel that had been ruined and unused for around 300 years! I cannot tell you how significant that felt for us, two people who have felt God’s call to come to France to offer ourselves in humble service to our Catholic brothers and sisters in Christ. We can only pray that it is a prophetic sign that God is about to restore and revive the spiritual ruin of this nation. There is a passage in the Bible that has become very precious to me. God has brought my wife and I to this ‘valley of dry bones’ – local churches are struggling due to a lack of priests, they have ageing congregations and little in the way of resources. This is the only possible response a human being can make. For all things are possible for God, but we cannot presume to know His specific will, we can only pray, trust and hope. God tells Ezekiel that He is going to bring these bones back to life and instructs him to prophesy to these bones, to tell them what God is going to do to them! As Ezekiel does this he starts to hear a rattling sound, bones moving together, re-assembling. Tendons, attach, flesh grows, finally skin covers these bodies, but they are still cadavers, still lifeless. Then God says to Ezekiel to prophesy breath to these cadavers. So I prophesied as he commanded me, and breath entered them; they came to life and stood up on their feet – a vast army. Perhaps on Saturday 14th August 2014 we heard a rattling sound. Perhaps we saw tendons, flesh and skin appearing. And it was wonderful. But we await the coming of the breath. We await the coming of the life of God, the reviving Spirit; the One who will cause a new people of God to come to life, to stand up, to begin to love and serve the Lord. This entry was posted in Bible, christian hope, Church, ecumenism, Restoration, Revival, Villy en Auxois by fuelforpilgrims. Bookmark the permalink.